The completely redesigned interior is a fusion of functionality, futuristic styling, and a high degree of personal space and craftsmanship. While the driver is situated in a sporty cockpit-type environment having gauges angled toward his or her direction, the front passenger is treated to a sense of openness and freedom that results from the innovative dashboard design. A key visual element of this driver-focused design concept is a sweeping yet elegant new character line that flows down from the instrument cluster and bisects the center console waterfall. The design of the entire front console strikes a smooth connection between the ease of use of all controls/systems and a handsome and modern sculptural look that is pleasing to the eye. All surfaces throughout the cabin—dashboard, instrument panel, centre console, door trim, etc.—employ the highest grade of soft touch and premium materials. Using an approach typically used in home furnishings, the design utilizes a mix of tones and hues throughout a space rather than a strict color profile. The result is a cabin space having diverse colors and materials, and that enhances passenger comfort and visual satisfaction. The new hybrid system has also been engineered to provide the ideal balance of energy efficiency with superior power output to maximize driving performance and enjoyment. The next-generation Toyota Hybrid System has been engineered to work in concert with the new 2.5-litre 4-cylinder Dynamic Force Engine setup offering significantly more driving excitement than before. The hybrid’s Continuously Variable Transmission (CVT) features a new Sport Mode setting that allows the driver to execute smooth yet quick “gear” shifts of the simulated 6-speed sequential shift transmission. The SE grade adds paddle shifters for increased fun and a more sporting driving experience. The Sport Mode setting also improves acceleration and feel thanks to an electric power boost from the hybrid system. Furthermore, to help enhance the vehicle’s handling capability, the hybrid system’s battery pack has moved from the trunk to beneath the rear seat for a noticeably enriched handling feel, thanks to the vehicle’s much improved lower center of gravity—yet another benefit of the TNGA platform. 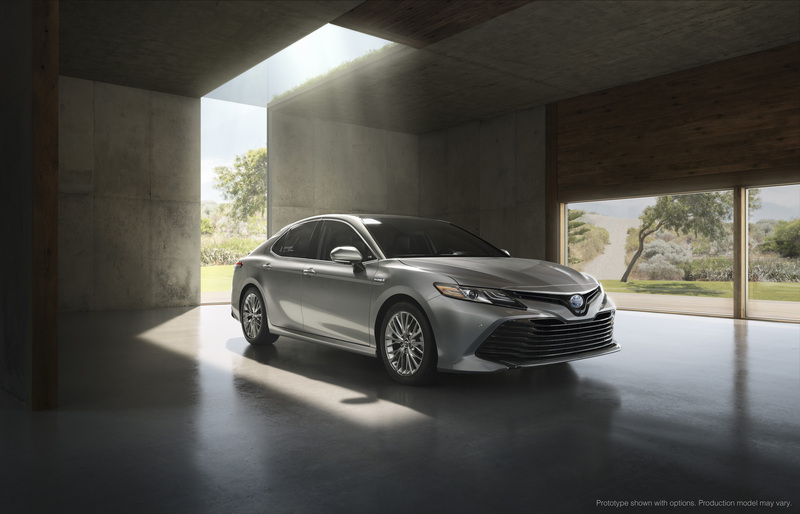 The new 2018 Camry will feature a standard 7” Display Audio with 6 speakers. A JBL premium audio system with 8” Display Audio and 9 speakers is also available featuring new advancements in sound quality. Sound enhancements include Sound Staging, which positions speakers directly in front of the listener to help emulate a live concert venue; Low Frequency Sounds, made possible by an added 10.1-inch subwoofer; Clari-Fi, a technology that “un-compresses” music to help restore an audio track’s dynamic range; and nine speakers that are specifically tuned to the Camry’s cabin dimensions and materials.